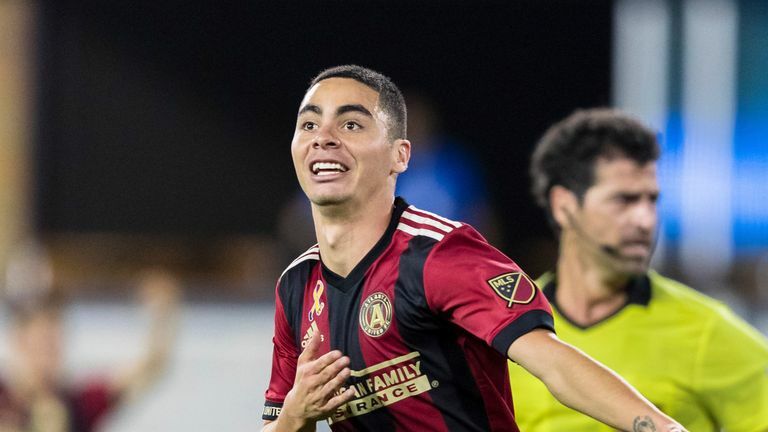 Miguel Almiron says he is not paying attention to the pressure on his shoulders despite becoming Newcastle's record signing. The Paraguayan midfielder moved to St James' Park from MLS side Atlanta United to become the Magpies' most expensive signing. Sky Sports News understands the fee was £21m. Almiron will be expected to help lift Newcastle away from the Premier League relegation zone - they are just two points above 18th-placed Cardiff - but the 24-year-old is unfazed. He said: "First and foremost, I see it as an honour, but it's something I try not to pay too much attention to. "It's something that is secondary when you compare it to the real reason I am here, and that is to help the team. I aim to bring something to the group. "I try not to think about that pressure. As representatives of this club, which has so much history, we have pressure on us. We want to do well and we know the fans demand that of us." Almiron only completed his move to Newcastle on Deadline Day at the end of last month, and is yet to play for his new team, but says he has already felt the support of the club's fans. "I'm really grateful for the way in which I've been welcomed by the supporters," Almiron said. "I've felt the support and kindness already. "But not only do they give that to individuals, but to the whole team as well. The support here is amazing and I really can't wait to turn out as a player here." Almiron, who scored 21 goals and registered 21 assists in 62 MLS games, also heaped praise on his new boss Rafa Benitez, and says he did not have to think twice about coming to work for the Spaniard. "I think it's a similar situation to when I went to Atlanta. As soon as I heard that Tata Martino [then Atlanta, former Barcelona and Argentina manager] had shown interest in me, I decided straight away. "It was the same when I heard of Newcastle and Rafa Benitez's interest. We all know what a great manager he is and what a great person he is. "Without hesitation I wanted to come and play for him and the club."